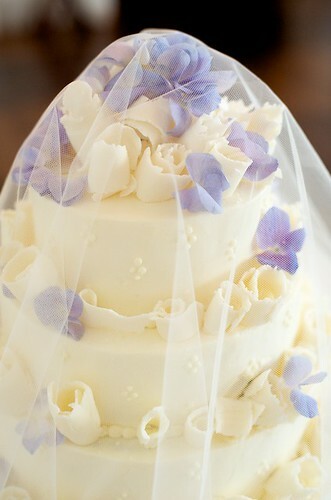 I think my husband knows by now that I have a bit of an obsession with the photos of our wedding cake. I have no good response for this. Sunday marked our very first wedding anniversary. We celebrated with a lot of packing, the movie Watchmen, a bottle of red wine given to us on our wedding day from two friends who had been in France (we were instructed not to open it until our first anniversary) and the top of our wedding cake that had been on the top shelf of my parents’ freezer all year. The packing went as you might expect, the movie was still just as good as we remembered in the theater, the red was quite nice and the cake was still remarkably tasty! The buttercream frosting had hardened a bit and tasted a little freezer burned, but the cake itself was great! I couldn’t believe it, so I had to eat most of it to be absolutely sure. 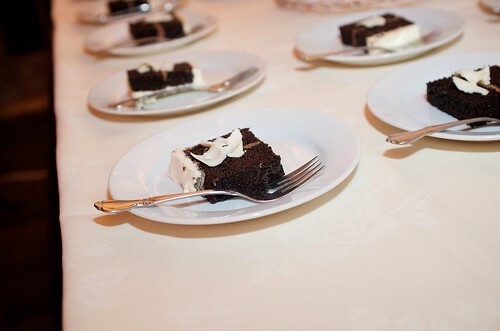 For the short time the cake existed last year before being devoured, it was four tiers. 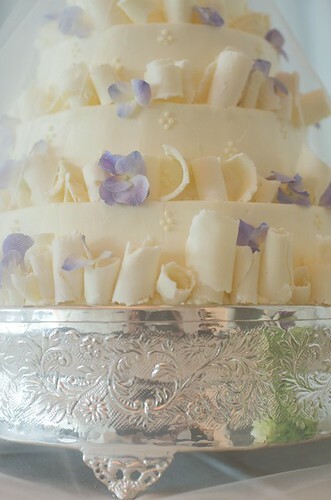 The layers alternated between yellow cake with blackberry filling and chocolate cake with chocolate filling – all frosted with french vanilla kiss buttercream and decorated with white chocolate curls and purple hydrangea. 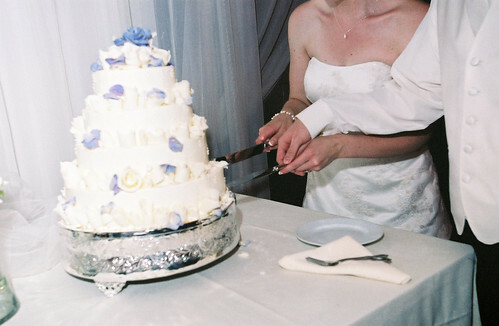 The cake sat on a 14″ silver cake plateau purchased online by my mom; we hope to keep it in the family for awhile. The cake was designed by Teri Edwards at Cakes Unlimited, who we can’t recommend enough if you’re planning a wedding in Charlottesville. 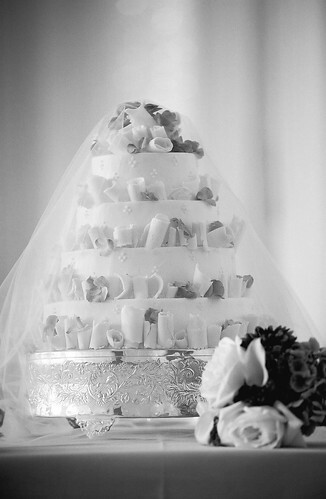 The same is true for Meredith Montague Photography – Meredith took all of the amazing wedding cake photos that I’m over-enthusiastically sharing with you today (minus, of course, this last photo of our cake top one year later, looking, well, a little sad!). I remember that cake very fondly! Cheers to a year! Happy Anniversary! I remember that cake too! I love the fact that you showed the cake before, and after 1 year. Have a great 2nd year. Happy anniversary, and congratulations! 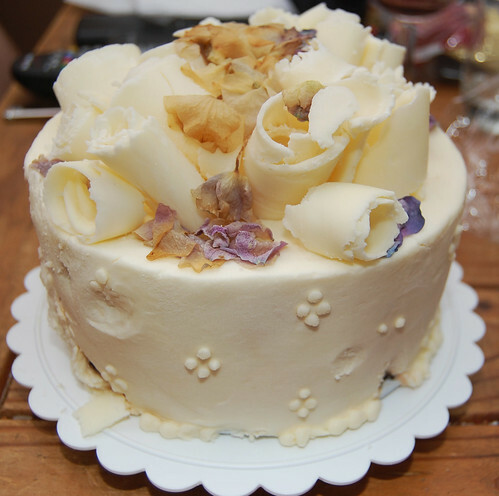 🙂 The flowers were frozen to the top of our cake, too, and they made the very top level of frosting taste like dead grass. I mean, I assume that's what dead grass tastes like!